Links Reading the title, somebody can think that the argument is a new Forex platform, but it is not. It's the story of my trading during the 2018, and about new experiences I acquired. Before exposing the events, I will make a small summary of my results from the beginning of my activity, starting from the moment I made the first operation with real money. I opened the account in November 2016, the day of the election of the new US president. I wanted to take advantage of the improbable, as it seemed that day, Trump's election. His election would have greatly impact to the currency market. At the end of the year, after less then 2 months of trading, I gained a profit of 20%. I was overwhelmed and sure that the future would be even brighter. Extrapolating that result, in a year I would have more than doubled the capital. I think everyone would sign for such performance. Unfortunately, the events did not go as I hoped. In 2017 I committed a series of errors that I exposed in the previous article. The outcome could also be defined catastrophic: the 2017 ended with a loss of 91% of the capital, including the part I earned in the past year. Only crumbs remained on my account. This fact greatly limited my possibility to make choices. In November I opened two positions with the rest of the capital. Unfortunately, both were opened at a wrong time, when the trend was going in the wrong direction. Finally, we come to the year reported in the title: 2018. 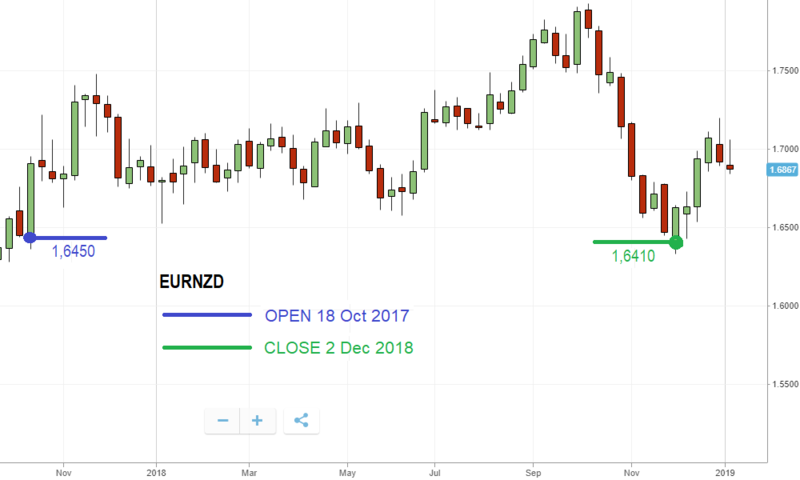 I entered with two open Forex positions: EURNZD (euro - New Zealand dollar) and GBPAUD (pound - Australian dollar), both short (selling) with leverage 10. At least I can say that I learned something of my previous missteps when I used leverage 25, too dangerous because it leaves little space for errors of assessment. I managed to hold back my own greed, preferring more security. In both cases the "Stop loss" was set to 100% of the invested capital. Fortunately, they both had a positive interest rate (overnight or rollover), so I earned something for every day that positions remained open. The values were going up and down, but they were not in the positive zone, where I could close them with the profit. I stayed inactive until December, when the EURNZD pair finally fell enough to be closed. I made a small income of 2.3%. Below I reported the weekly chart showing the trend of the pair in the period between opening and closing. It is interesting to note that I earned 2.3% on the difference between the sale and purchase price, while on the overnight refund I received 25%, ie a quarter of the invested amount. I had already clear this concept and I was mainly opening the positions that guaranteed the positive daily interest, in case they remained open for a long time, but this event has deepened the possibilities of this indirect gain. The other position (GBPAUD) even today, at the beginning of 2019, is still open. January 15, the British parliament rejected the agreement that the Prime Minister has signed with EU. I was hoping so much in a fall of the pound, to close this position, active for 15 months. But nothing to do. After a slight decline, the pound has even strengthened. I want also to mention the fact that the overnight refund at some point has become overnight fee (negative interest rate) and therefore this currency pair has made me loose some more money. With a little capital obtained from the closure of pair EURNZD I was ready for a new action. Stimulated by the income coming from the overnight refund, I worked hard to examine the interest rates for all couples. I noticed two couples. The pair US dollar - Mexican peso (USDMXN) yields $ 1.45 a night for the couple's $ 10,000 sale, that is 0.0145% per day. Using the leverage 5, an annual interest rate of 0.0145 x 5 x 365 = 26% is obtained. The value was high and therefore I opened a short position, closing it profitably after 3 days. Then I moved on to trade with US dollar - Turkish lira (USDTRY). At the close of the position that happens every night, this couple pays an incredible $ 5.69 for an amount invested of $ 10,000. Translated into an annual interest rate and applying a leverage 5, the 104% is obtained. In other words, if you sell the pair and buy back within a year at the same, sales price, namely without any gain or loss, the capital doubles, thanks to the overnight refund. This fact opened me another perspective on Forex. During the month of December, I realized 3 positive operations with this couple. At the end of the year I had a 28% profit. Very good, considering also the fact that I have completed only 5 operations. Of these 28%, almost half are due to the positive overnight interest rate. Below is the table with all the transactions closed in 2018. All the new operations were managed with leverage 5; so, I further decreased the risk. There are two reasons for this adaptation. One is the fact that the Mexican peso and the Turkish lira are two relatively unstable currencies and with the decrease of the leverage, I tried to mitigate this risk. The other reason lies in the new European regulation that regulates the currencies trade and that limits the value of "Stop loss" to 50% of the initial capital invested. Since my idea is to always "defend" the position, this rule has cut my margin of safety by half. The plan for 2019 comes from the experiences of the past years: short-term trade, even daily, with a low level of risk using leverage 5, but in some cases I am also considering 2. I intend to open positions that have a positive daily interest rate; this guarantees some return even when the opening moment is wrong and is in a negative trend. If the value goes very close to the "Stop loss", with the money I earn daily (it is a kind of coupon that comes every day) I will be able to defend the position by increasing the closing limit.